The couple met at Harvard and have been together for more than nine years. 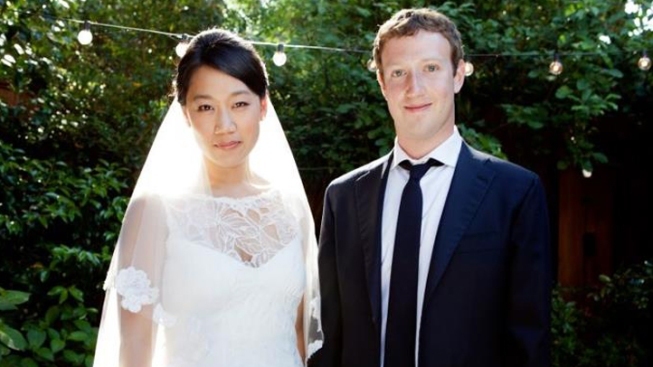 Mark Zuckerberg (right) poses for a photo with Priscilla Chan (left) during a small wedding ceremony in Palo Alto, Calif. This photo was posted to Mark Zuckerberg's Facebook page on May 19, 2012. Facebook founder and CEO Mark Zuckerberg has updated his status to "married." Zuckerberg and 27-year-old Priscilla Chan tied the knot at a small ceremony at his Palo Alto, Calif., home Saturday, capping a busy week for the couple. Zuckerberg took his company public in one of the most anticipated moves in Wall Street history Friday. And Chan graduated from medical school at the University of California, San Francisco, on Monday, the same day Zuckerberg turned 28. A company spokeswoman said Zuckerberg designed the ring featuring "a very simple ruby" that he designed himself. The ceremony took place in Zuckerberg's backyard before fewer than 100 guests, who all thought they were there to celebrate Chan's graduation. NBC Bay Area's Monte Francis saw Billie Joe Armstrong, lead singer of the rock band Green Day, leaving Zuckerberg's house around 8:30 p.m. with his guitar in hand. Guests danced to a variety of songs, including Ciara's "One, Two Step," Michael Jackson's "Rock with You" and "Billie Jean," Katy Perry's "California Gurls" and Bon Jovi's "Livin' on a Prayer." Neighbors didn't seem to mind the noise. "Nah it's cool," neighbor Keith Kleiner said. "Everybody likes to party, why shouldn’t Zuckerberg party?" The couple met at Harvard and have been together for more than nine years. No word yet on where the couple will be spending their honeymoon.